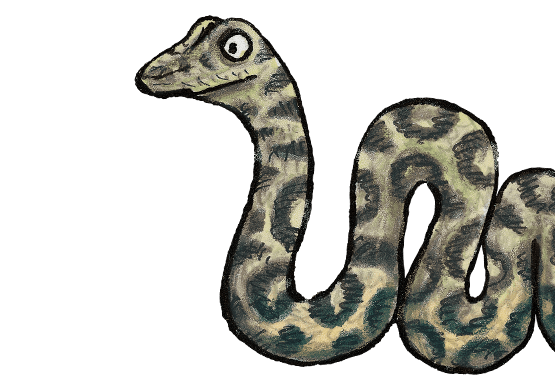 The Gruffalo ©1999 Julia Donaldson & Axel Scheffler. 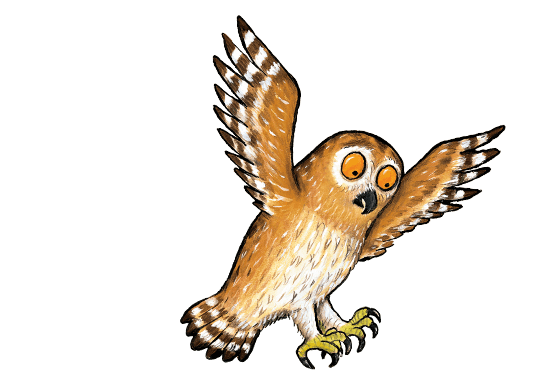 Licensed by Magic Light Pictures Ltd.
Favourite characters from Julia Donaldson and Axel Scheffler’s beloved children’s picture books feature in this adorable frame collection. 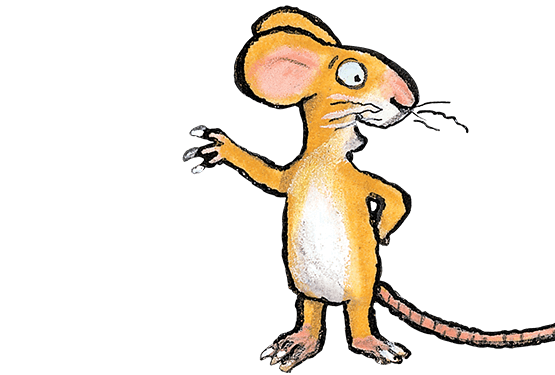 The range includes six frames in total; two different designs for each of the best-selling and award-winning titles ‘The Gruffalo’, ‘The Gruffalo’s Child’ and ‘Room on the Broom’. 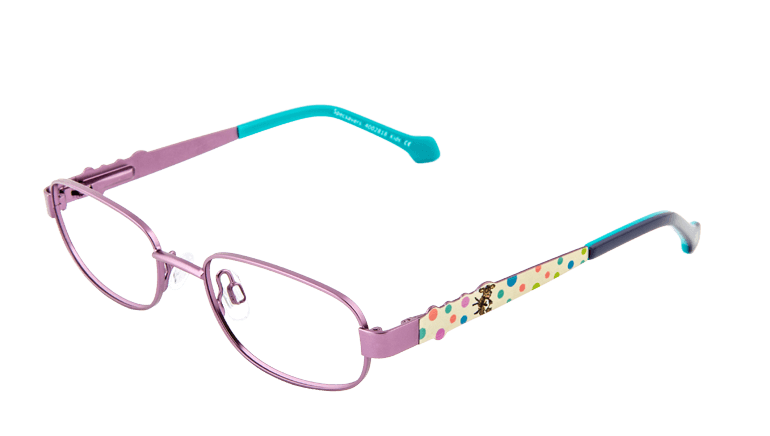 All of the frames are part of our kids’ 2 for 1 offer. 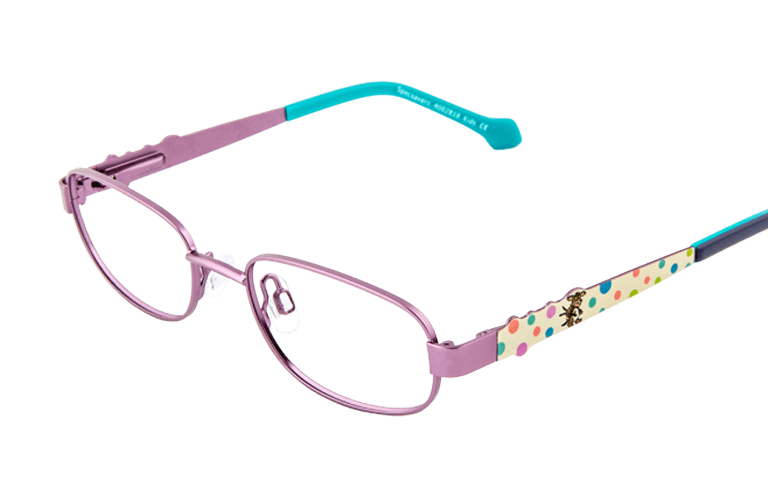 This endearing, flex-hinge frame is perfect for Gruffalo fans. 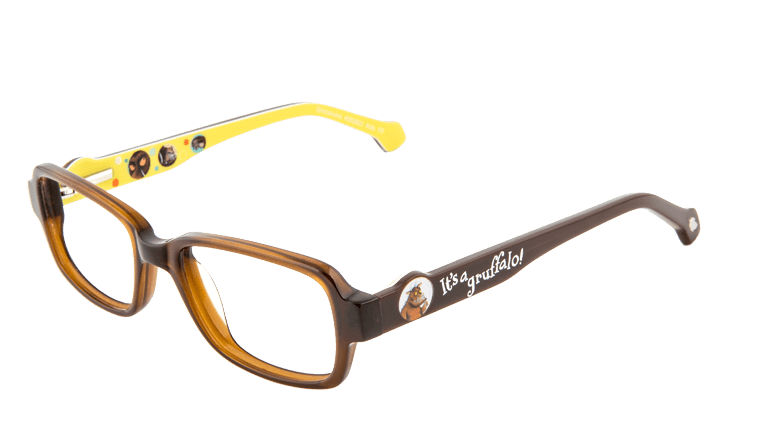 The chocolate brown acetate plastic is the same colour as the Gruffalo’s fur, brightened with a playful sunshine-yellow interior. Fine design details on each side include: a white candy-stripe on the top, matching the white infilled engraving ‘It’s a gruffalo!’; a silver leaf on the temple tip; and pictures of the Gruffalo, both on an exterior disc and printed inside. 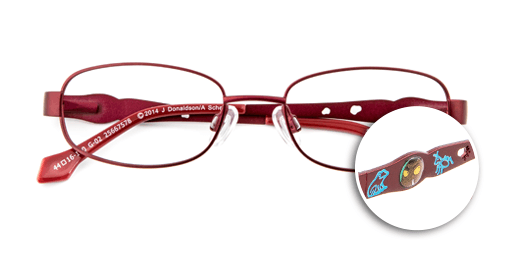 SKU 25667561. 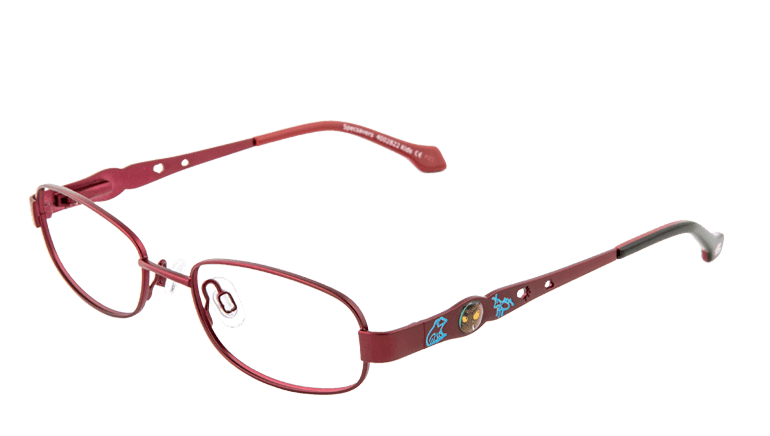 A delightful, oval-shaped, satin ruby red, metal frame that features details from The Gruffalo storybook. 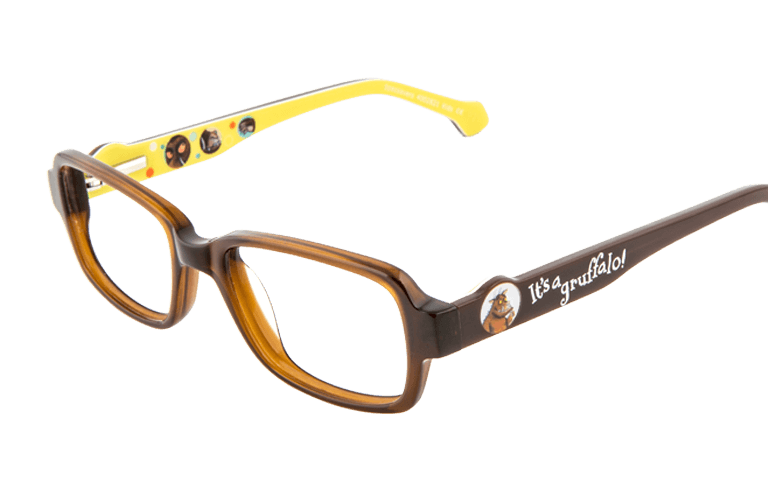 Each side has a disc printed with a picture of the Gruffalo’s eyes and a silver leaf insert on the black acetate plastic temple tip. 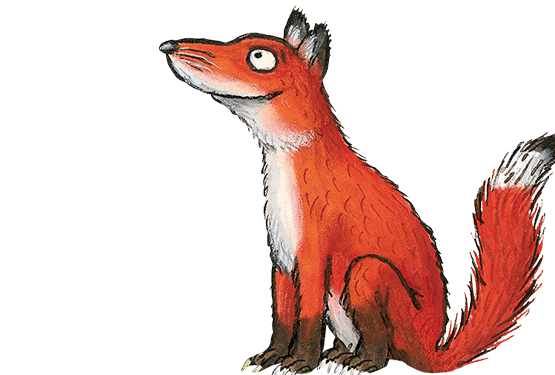 Gruffalo footprint-shaped cut-outs and blue engravings of a frog and a bug complete the design. SKU 25667578. 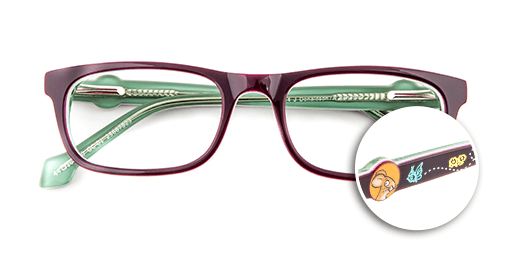 Be enchanted by the Gruffalo’s Child with this charming oval-shaped, dusky purple metal frame. 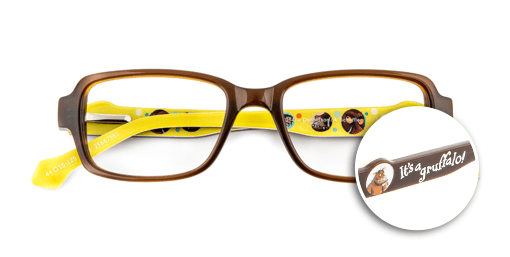 Each side is printed with a multi-coloured polka dot pattern, featuring the Gruffalo’s Child in the centre. 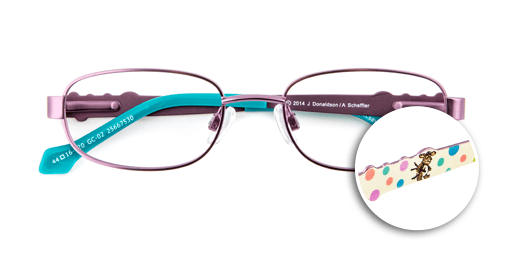 The dual-coloured acetate plastic temple tips are grape purple on the exterior and a rich teal on the interior, complete with a silver leaf inlay on each temple tip. SKU 25667530. 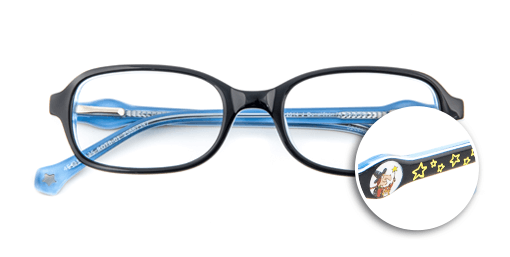 This bewitching, oval-shaped, acetate plastic frame has a triple layer of colour in rich navy blue, white candy-stripe and powder blue. 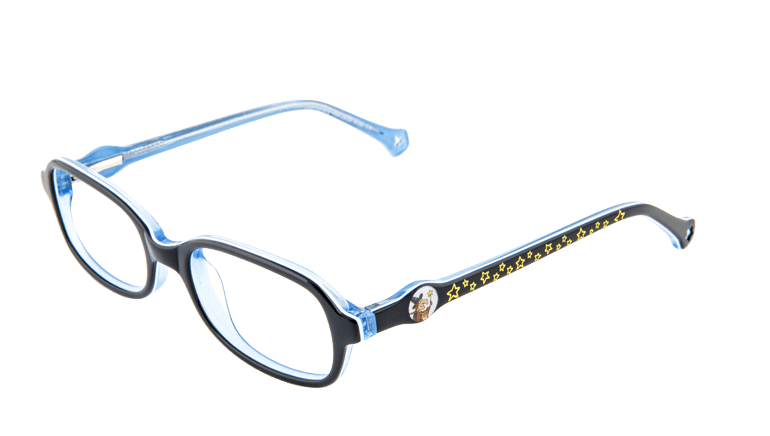 Magical design details include a circular disc with a picture of Witch and Cat on the side, engraved, yellow in-filled stars and a cute star cut-out on the temple tips. SKU 25667547. 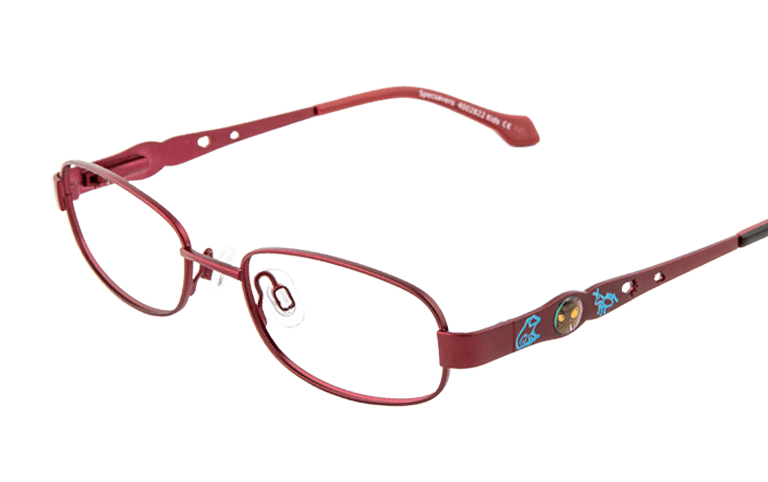 This multi-layered acetate plastic frame in burgundy, candy pink, baby blue and semi-translucent mint green features the mouse on each side, as well as a playful blue butterfly trail and yellow-infill engraved flowers. Silver leaf inserts on each temple tip complete the design. SKU 25667523. 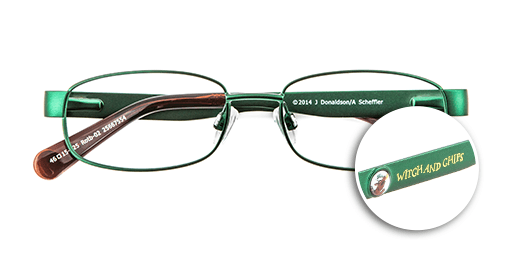 This metallic, forest green frame depicts Dragon on the sides. 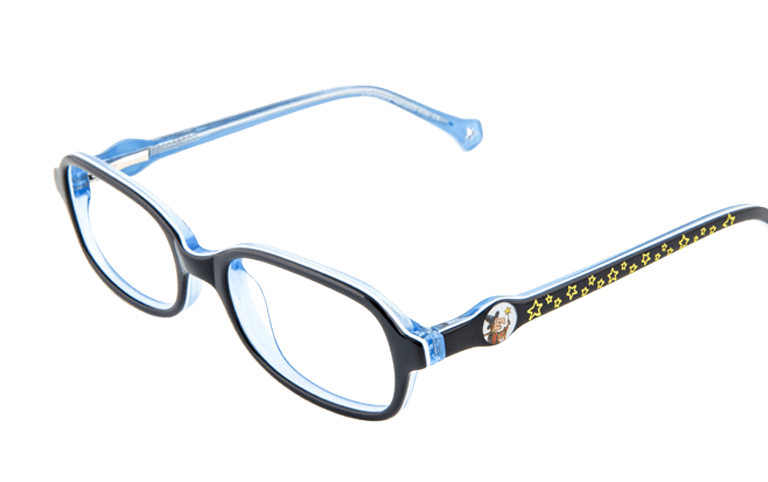 Dragon’s favourite food, ‘WITCH AND CHIPS’ is inscribed in yellow, and the star from Witch’s magic wand features on the brown acetate plastic temple tips. SKU 25667554.